Design variations of the Serial plate? Topic: Design variations of the Serial plate? 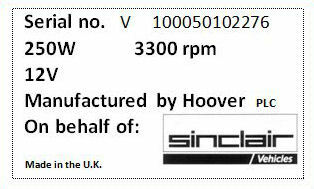 Just a quick query, before the complete strip-down and clean/fix of my new C5 I noticed my Serial number plate was of a different design than I had always seen, with all mention of Hoover removed. Was there many different designs or just a different of designs between UK models and export models? Re: Design variations of the Serial plate? The one you have on your C5 is the correct factory applied version , the other one you have pictured is the after market version someone on the forum made a few years back ..